Please fill in the transaction notification form. Please send the filled form attached to an e-mail to the Company and the Financial Supervisory Authority promptly after the date of the transaction. In case of any problems, please contact johdonkaupat@robitgroup.com or +358 45 202 0252. 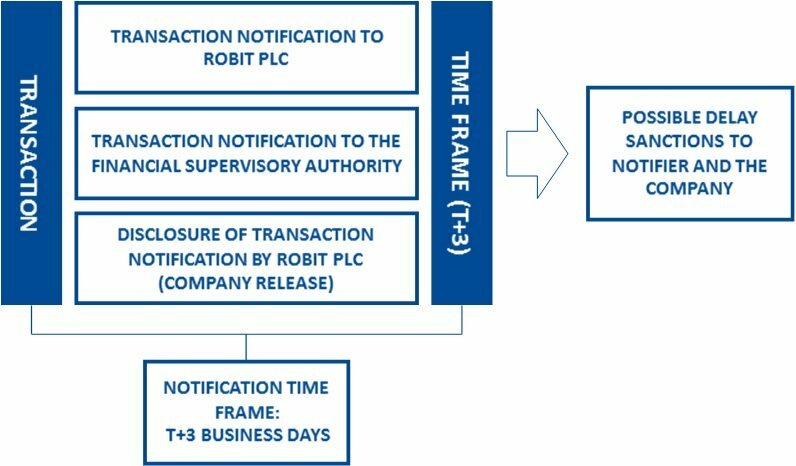 Robit Plc publishes the notification it has received in a company release promptly after receipt of the notification. As of 3 July 206, published notifications of transactions by managers and their closely associated persons can be read at https://www.robitgroup.com/?investor=releases/stock-exchange-releases. Further information on the regulation concerning the notifications of managers’ and their closely associated persons’ transactions is available at, for example, http://www.finanssivalvonta.fi/fi/Saantely/Saantelyhankkeet/mar/19_artikla/Pages/Default.aspx.